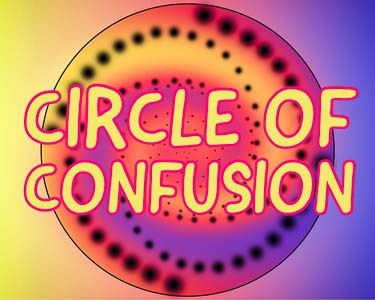 It is likely that there has never been a term that is more aptly named than the circle of confusion. Through an understanding of the Circle of Confusion will come a mastery of depth of field. A mastery of depth of field will dramatically enhance every photo you take. If you’re like most people, when you first encountered the term and concept of Circle of Confusion, you were, well…confused. Well, be confused no more! I aim to not only make the concept easy to understand but also to help you to utilize it as a tool to improve your photography. Let me start by providing some context around why this all might be useful. If you’ve tuned into any rudimentary discussion on depth of field, you’ve likely heard the phrase “acceptably sharp”. This is, of course, referring to the part of the image that is within the depth of field and thus considered to be “in focus”. It was my own frustration with my lack of knowledge around “acceptably sharp” that led me to write this article. Here’s the issue: The only part of the image that is truly in focus is the subject that is located directly at the focus distance on the plane of focus. EVERYTHING short of this distance and beyond it is technically out of focus to some degree. This is where “acceptably sharp” comes into play. Some of the image that is closer than the focus distance is acceptable and some of what is beyond the focus distance is also acceptable. 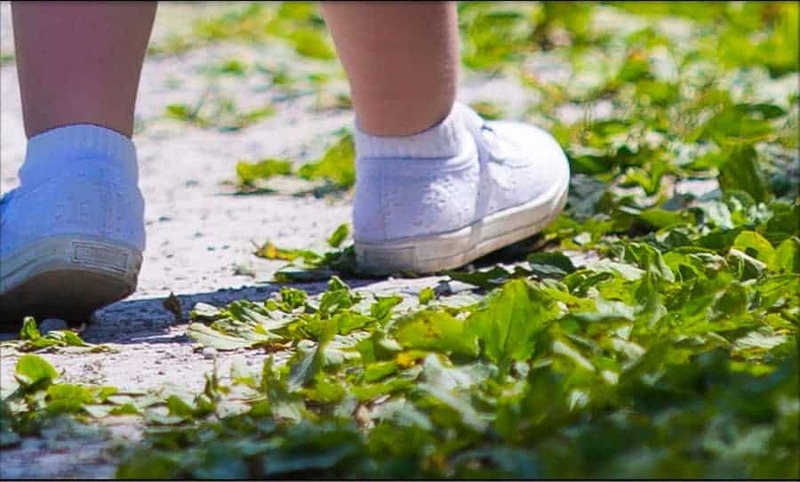 In this image if one were to zoom in tight enough, they would notice that really only the area right at the back of my daughter's heel is what is in focus as well as everything that is the same distance from the sensor. Viewed at a normal distance a slight area in front of her and behind her appears to be “acceptably sharp”. Tight view at feet in same shot. Exactly how much is acceptably sharp depends on a variety of factors. The really neat thing is, we can apply the concept of circle of confusion to gain total control over these factors and ultimately control exactly how our final image is perceived. How large can a single dot on a sheet of paper be before it is no longer perceived as a singular point but as a blurry blob? This is the circle of confusion (CoC). This is an illustration of light coming from a single point in a scene, passing through a lens and being projected onto a sensor (yellow plane). 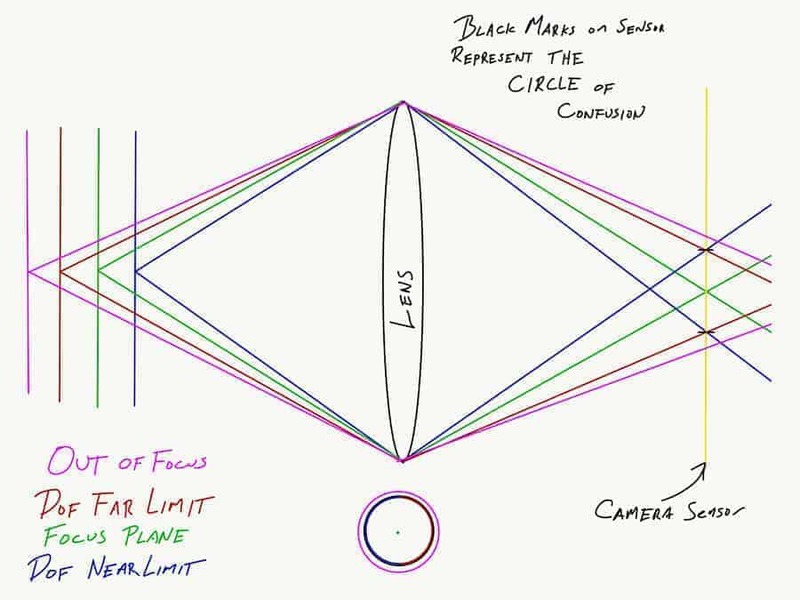 As long as light focuses into an area on the sensor smaller than the black lines, it will fall within the designated circle of confusion and be “acceptably sharp”. Consequently, it will create a blur spot that will fit within the black circle at the bottom of the illustration. In this example, everything at distances between the blue line and red line will be within the Depth of Field. There are 3 main factors that determine the CoC value. The enlargement of the final image from the original. The original here is the image on your actual sensor. If you’re shooting a “full frame” camera, your original image is 24 mm by 36 mm. Any final production of your image beyond that is technically an enlargement. The distance from which your final image will be viewed. The closer we are to the image we view, the more likely we are to perceive a blur spot as a blur spot and not a singular point. The visual acuity of the person viewing the image. We have no real control over this last factor, but we have some idea of what is normal. Another illustration of the concept. Each “blur spot” on this image was created using the same brush in Photoshop with the same softness. Which dot appears to be a single point to you depends on the conditions in which you are reading this article. If you're on your phone, perhaps you only have to go 3 or 4 rings in before you will decide that the black dot is a single point rather than a fuzzy blob. If you're on a large desktop monitor, perhaps only the smallest center point is not fuzzy. The final product has a huge say in what is in vs. out of focus. 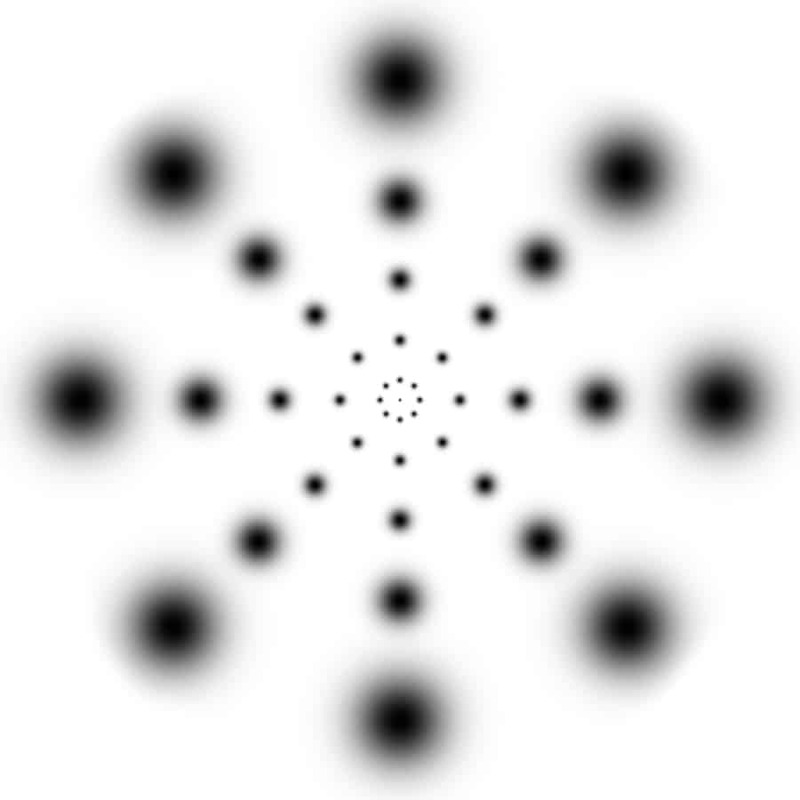 The more we enlarge an image, the more likely our blur spots are going to be perceived as such rather than as sharp points when viewing distance remains unchanged. The common industry standard/default final image size used in many depth of field calculators is 8” x 10”. 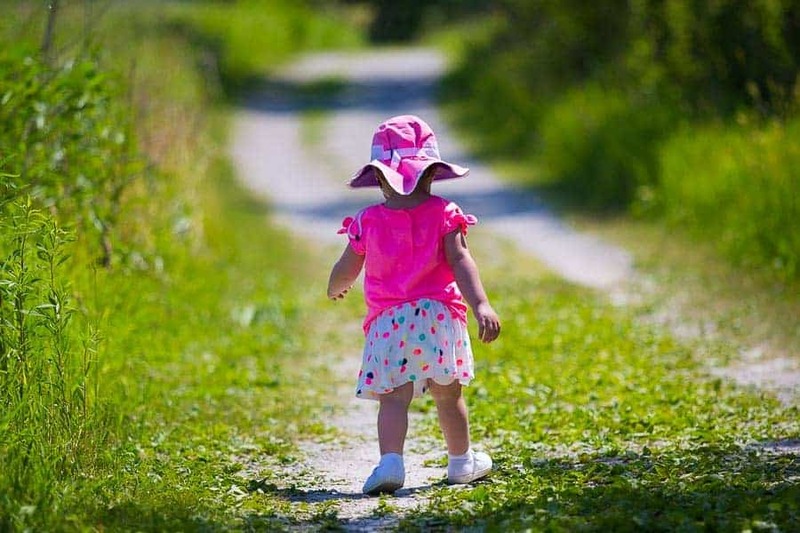 The two images of my daughter on the path above is an example of two different levels of enlargement. The second, cropped image is simply enlarged to a greater degree. If you’re planning on printing larger than that and expecting your viewers to closely inspect your image, you will need to account for it and realize that your blur spots will need to be smaller (smaller CoC) to be acceptably sharp. Your enlargement can range anywhere from 2.5”x2.5” (Instagram post viewed on a typical smartphone) to a billboard which can be as large as 48 feet wide and 14-20 feet tall. Naturally the billboard is viewed from a much greater distance. More on that next. The standard viewing distance for the 8×10 image outlined above is 10”. The general idea is that as the image size increases, the viewing distance will as well. As a guide, use the longest edge of your final image as the viewing distance. As image size increases and viewing distance increases correspondingly, the CoC will remain unchanged. However, if you expect that your viewer will view your work from a much closer distance or zoom in to fine details on a digital version of your image, you will need to account for this. As viewing distance decreases, you will need to utilize a smaller CoC to maintain acceptable sharpness within your depth of field. Conversely, as in the case of the billboard above, the viewer will most likely be much farther away than this standard resulting in a larger CoC being allowed to achieve proper sharpness and depth of field. Visual acuity is something that needs to be considered but is not something you will have much control over. Different people have different levels of visual acuity. Based on some research that has been done, most calculators will make the assumption that a standard viewer will perceive a blur spot on a final image that is 0.2 mm as a point when viewed from 250 mm (10”) away which corresponds to about 2.75 minutes of arc. Some individuals will have greater visual acuity than others. So, if we assume that we are shooting on a 35mm full frame format and intend to produce a final image in the 8×10 size (which is cropped slightly of course) and our viewer who has a “standard” level of visual acuity looks at our image from a distance of 10” we will have a CoC of 0.030 mm. Again, that is a standard benchmark for the largest size of a blur spot on our camera sensor that will be perceived as a singular point by our viewer in the final image. A spot with a diameter of 0.030 mm on a full frame sensor will appear as a spot that has a diameter of 0.2 mm on the final 8 x 10. Again, as image size increases, the viewing distance will tend to increase correspondingly. Because of this tendency, the consistent standard CoC will remain constant. However, if your application changes, you will want to adjust your CoC to match. We’ll look at a couple of applications and learn how to wisely adjust your CoC to achieve the desired depth of field. To Illustrate, I’ll look at two very distinct applications for using your image. Instagram vs a massive print in a small room. In both cases, we’re capturing and conveying the same scene. It is a sweeping landscape shot with a flower in the foreground. We desire to have maximum depth of field with everything in the frame in acceptable focus. The flower is moving around in a light breeze and timing is around sunset, so light is limited. We are stuck with 1/60 of a second as our longest shutter speed to freeze the movement and the light is equal to EV100 12. So, to stop down below f/8 we are going to have to increase ISO beyond 100 to create a balanced exposure for our scene. Really, you could apply this to many social media platforms. I chose Instagram as my example for a couple of reasons. First, despite its flaws, it is a favorite among photographers. Second, it is, by design, destined to be viewed on mobile platforms above all others. Sure, most of your traffic to Facebook is probably mobile as well, but you would want to account for the users that are likely to see your work on their large desktop screens as well as on their phones. With Instagram, viewers see your work via their phone almost exclusively. In our scenario, let’s assume that you are trying to gain a solid following on Instagram and become “Insta-Famous”. You would like to post the best possible work you can to the site and explore as many creative possibilities as you can. Your desired genre of photography to post is Travel/landscape photography. You know that in most cases, lots of depth of field will be required to produce the best results. How much depth do you need? Visiting back to the basics, your photo is only truly in focus at one plane in the photo. Everything else within the depth of field is just “acceptably sharp”. So, you want to start at the top and try to determine what that means for you and your specific medium. You define this by determining your circle of confusion. You plan on shooting your photos on your new Sony A7RIII and your backup Sony A7III. In PhotoPills, you plug the cameras into the depth of field calculator and you notice that it indicates a circle of confusion of 0.030 mm for each one. You remember reading this article and that 0.030 mm may or may not be right for you. So, you take the dive and you click the “Advanced” button at the bottom of the screen on the calculator (don’t you feel awesome just tapping that icon?). At the top of the screen, your camera name is replaced with “CoC 0.030 mm”. You realize that you can change it! But, what do you change it to? PhotoPills can calculate your CoC for you. If you’re as good at math as I am, you really appreciate this. Now, on Instagram, your viewers are not viewing your image as an 8×10. They’re on their phone, which is likely much smaller. On my iPhone X, a standard image on Instagram is a 2.5” square, so let’s go with 3” by 3” just to be safe. Now, just because the image is smaller, does not mean that your viewer will hold their phone closer to their face. They might once in a while, but it won’t be the common practice. It is just uncomfortable to do so. Just try reading this on your phone with your phone 3” from your face and you’ll see what I mean. So, the standard viewing distance might still be something like 10”. By plugging those dimensions into PhotoPills, the CoC jumps all the way up to 0.109 mm. Armed with this knowledge, some additional creative possibilities open up. Let’s say you’re shooting the scene above with a 24 mm lens and you need to be at f/8 to get the shutter speed you need. Stop down more, and you’ll have to stretch your shutter speed creating undesired motion blur or you’ll have to stick with the limited light gathering and use ISO which will show noise. At the standard 0.030 mm CoC, with a 24 mm lens at f/8, the hyper focal distance for the shot is at 7’11”, meaning that everything from about 4’ to infinity will be in acceptably sharp focus (for the 8×10 at 10”). If you want to something within that 4’ range to be rendered in focus, you would need to either focus stack. So, there’s this beautiful flower (and it’s blowing in a light breeze, hence the shutter speed issue) that you want to have about 3’ from your camera. Perhaps you focus stack. Your followers are hungry for your images though! It’s peak posting time soon and you want this image to hit your feed right away. Additionally, you don’t have your computer handy and you’re planning on using a mobile workflow to process your image. Focus stacking might be tough on a mobile editing platform. But wait…You may not need to focus stack… If you take into account, your desired final image and how it will be displayed, you can take advantage of that CoC of 0.109 mm. This widens your range of “acceptably sharp” more than enough! With this CoC, your hyperfocal distance comes all the way down to 2’3” with everything from about 1’1” to infinity being acceptably sharp! So now one shot will work. Note that if you plan on printing the same image later at a much larger size you may want to grab the frame for focus stacking later as it may be needed in that application but for your Instagram post, you’ve got what you need, and you can feel good about posting your image at the exact right time. Let’s flip the story now. You want to print your photo to colossal proportions and really invite your viewer into the image to explore all the fine details. You’re going to hang your final image in your relatively small gallery space and you expect that your viewer may be as close as 10” to your print which you want to measure 6’ wide and 4’ tall. Acceptably sharp takes an entirely different meaning in this application. Note that the same might apply for an image that is viewed digitally with the viewer zooming way in to catch the details. Check out VAST for some examples of VERY high resolution photos that are examples of what I am talking about. So, plug your requirements into the calculator in PhotoPills. With a CoC of 0.004 mm you don’t have a lot of wiggle room. You’re dealing with some serious limitations, but your final product is going to be awesome! You also realize that printing that large with viewers that close, you’re going to need even more resolution than your A7RIII can offer. The way you achieve this is through shooting a multi-shot panorama through a longer lens and stitching it together in post. You’re shooting the same landscape with the flower as outlined above. You decide that shooting an 8 shot panorama (2 rows of 4 shots each in portrait orientation) using your 50 mm lens will give you the field of view you need as well as enough resolution for the final image. You’re still stuck with the relatively fast shutter speed due to the flower and other foliage moving in the breeze, which also sticks you with the f/8 aperture to gather enough light to keep noise to a minimum. 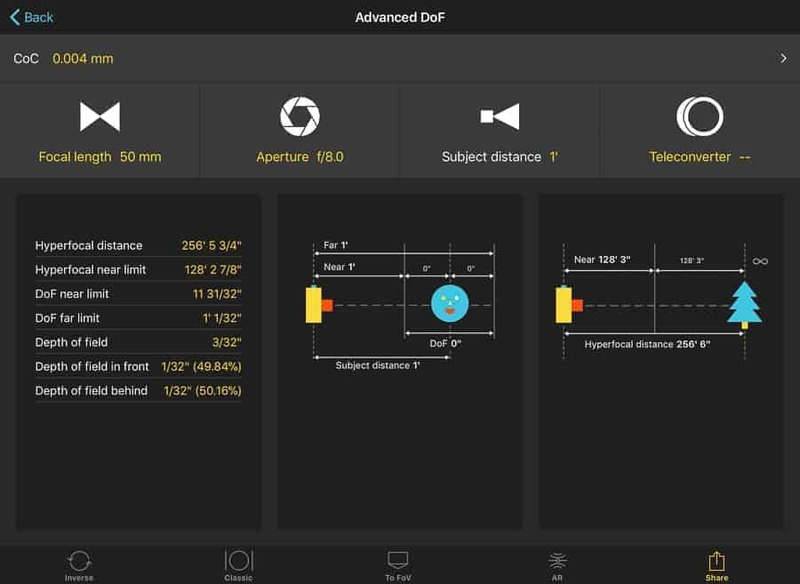 Additionally, diffraction becomes a much larger issue with this application so we want to use the absolute sharpest aperture on our lens which happens to be f/8 in this case. With these settings and your CoC of 0.004 mm your hyperfocal distance jumps WAY up to over 256’. You’re going to need to focus stack (A LOT) and this shot just got a lot more technical. You end up getting the shot with multiple panorama stitches at multiple focus distances and everything is in sharp focus! Congrats! You just created an epic image. As you stop down sufficiently, diffraction becomes an issue. Without getting into the specifics of diffraction, know that the small aperture will soften your image. The blurring is not the same as when your image is out of focus but as the blur spots grow in size they will eventually grow larger than your CoC. When this happens, depth of field is offset by blurring from diffraction. This is the technical limit of stopping down to increase depth of field. The area that is closest to in focus will remain (so technical depth of field remains unchanged) but no part of the image will look tack sharp at some point. That is, unless the image is small enough or viewed from a large enough distance that the blur spots caused by the diffraction are smaller than the appropriate CoC for that size/distance combination. Even the best lenses in the world are not optically perfect. An optically perfect lens would take the incoming light from a part of the scene that is in focus and place it in a perfectly small blur spot on the sensor. 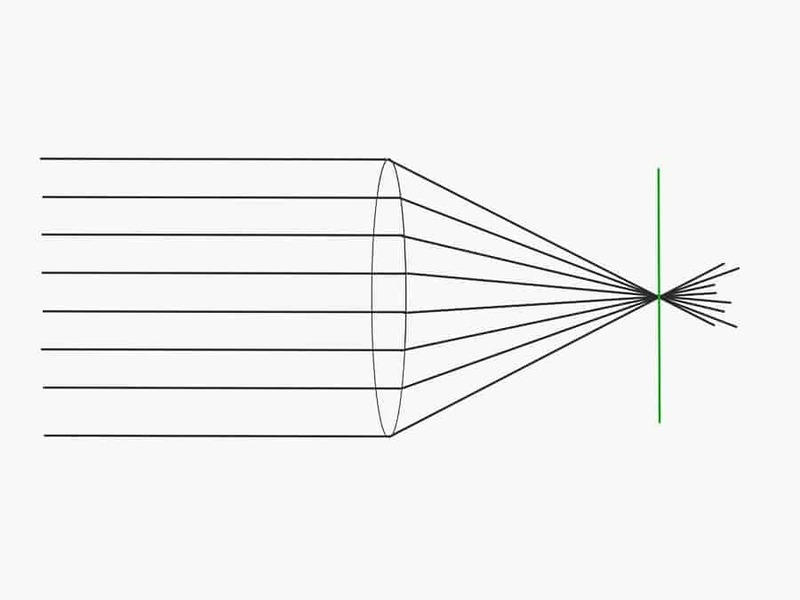 An illustration of an optically perfect lens. Light is focused very precisely at the sensor plane. 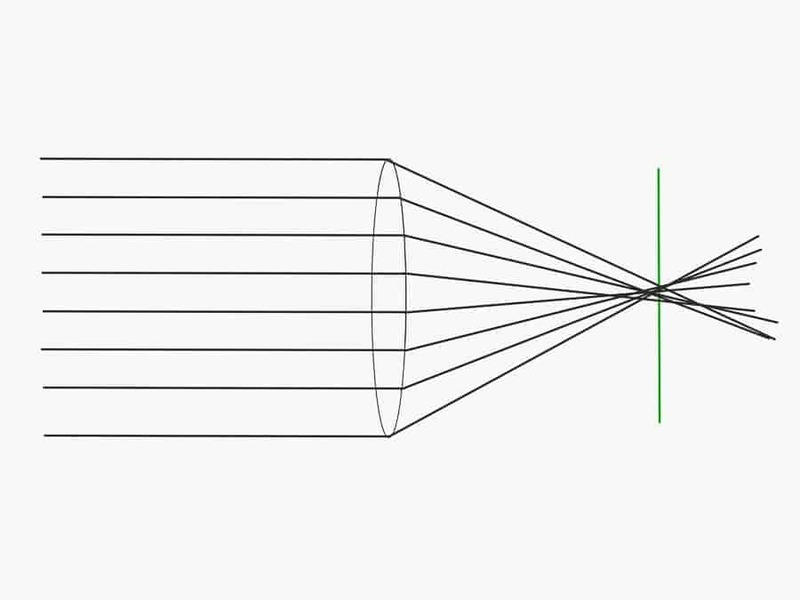 More realistically, lenses perform as in the illustration below. They have a spot where focus is best but it is not perfect anywhere. Some lenses are better than others and any given lens will perform differently at different points in the zoom range and at different apertures. This is the principle behind our recognizing one lens as being sharper than another. A more realistic, “imperfect” lens. If our imperfect lens fails to create a blur spot at any focus setting that is smaller than the CoC, then no part of the image will ever appear to be in focus. Hopefully any confusion you may have had over the Circle of Confusion is cleared up by now. It is an interesting topic and can really be leveraged to open new doors or help you to make use of different situations depending on your final intentions for the use of your image. “Acceptably sharp” should have greater meaning now and with the ability to control this variable, the overall quality of your final images should be greatly enhanced.